Concept and Narrative Natural Science is a subject of researching and studying about the Earth’s geological and natural systems. It is important to acknowledge and explore how these systems have shaped and changed human’s life on Earth over centuries. The Earth’s natural forces, either created by internal or external energy, have a significant impact on changing its physical elements, such as landform, materials, water, atmosphere etc… These elements, as a result, have influenced and become driving force for human’s settlements, activities and behaviours. Vision and Aims Responding to client’s brief of creating a resilient urban University Campus, the design aims at creating and encouraging study to engage with outdoor study environment surrounding the Campus. By using and modifying natural elements, the landscape will become a force that influences and drives students’ activities, hence, create different dynamic outdoor study spaces. 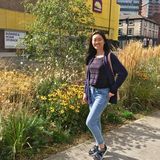 Studying at the University of Sheffield has given me a huge opportunity to enter a professional working and learning lifestyle, where I was taught and led by skillfully dedicated teachers and tutors. Also, learning in an internationally multidisciplinary environment has become a stepping stone for me to chase my real dream to become a real landscape architect in the future. A museum as a landmark of the site, from far distance, drivers and pass-byers can easily notice the faculty of natural science. Being located by the main entrance, the museum is also an occasional exhibition place displaying students’ researches. An open space in front of the museum functioning as holding a group of people whenever there is special event inside the museum. Holding events such as graduation day, science day, open day, etc. The study hub is enclosed by the modern planting area which represents the resilientclimate planting. Apart from this, the science hub is also an outdoor experiment planting area for resilient future vegetation, an outdoor laboratory for researchers. represents the idea of creatures created by geomorphological process on Earth and showing the geological character of Derby. As well as the continents have shifted because of both natural forces and manâ&#x20AC;&#x2122;s forces, the planting also evolved from the simplest to more complex forms and structures. The mixture in rain garden would be a witness of transition from time to time. Ferns and medium-height wet-lover herbaceous grasses and flowers would be planted in rain gardens to emphasize the theme of a transitional valley. Evergreen ferns are used to keep the structural form of the mixture when other herbaceous vegetation might lose their structures and forms in the winter or late autumn. 02 Route map Urban Redesigned Route Redesign the route from old canal basin of Victoria Quays Sheffield (based on the serial visions theory of Gordon Cullen) “If, therefore, we design our towns from the point of view of the moving person (pedestrian or car born) it is easy to see how the whole city becomes a plastic experience, a journey through pressures and vacuums, a sequence of exposures and enclosures, of constraints and relief.” (Cullen, G, 1971). 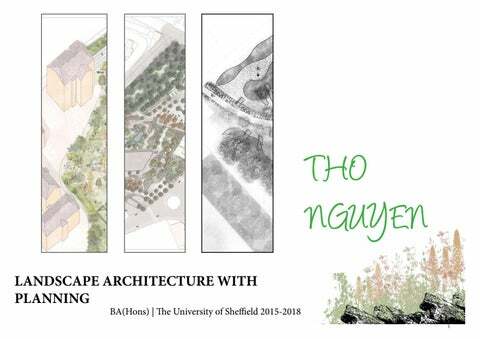 Basing on the concept of ‘Townscape’, the sketches articulate the idea of serial vision from ‘here’ and ‘there’, taking readers through the journey of sense and changes of landmark features, focal points, and partiularly providing experience of flowing in spaces. Mix old concrete slabs and new resin bound aggregate to match with the concept (the old and the new). Gabion seating (using recycled rocks or bricks along the edge of rain garden, trees cast shadow for users. all seatings are 50mm high, table 70mm high. 27 26 30 11. M6 mortar joint 10mm thick between brick (1 part cement ½ part lime 4 ½ parts sand). Mortar joints should be weather-struck to protect the lower brick; troweling across the mortar into the brocks and forms a more weatherproof joint. 12. A393 reinforcement mesh placed centrally. 13. RC35 concrete cavity (ready mix concrete), meet the British standard BS 8500-2. 14. High bond DPC sandwiched in fresh mortar and projecting beyond the face of the wall. 19 Pennisetum alopecuroi- 16 Calamagrostis x acutiflora des Hameln ‘Karl Foerster’ 15. RC35 base with A393 reinforcement mesh 18. Coarse sand 100mm thick as transition layer. 14 Gravel Salvia xaggregate sylvestris 6/12mm top and bottom with 50mm cover 19. for filtration cladded18 with non-woven 18 Echinacea Deschampsia ‘Rugen’ fleece membrane, 16. H10 starter bars at 200mm centers geotextile 325mm‘Magnus’ thick. purpurea cespitosa ‘Goldtau’ 17. Loam, loam/sand mix 20. DN 25 pipe in PVC to divert overflow, cladded in non-woven geotextile fleece membrane to prevent from fine soil particles. or sandy loam capable 29 21. Reclaimed concrete slab pavers from the site, varied size range from of supporting vegetative 500mm to 2000mm match the concept breaking glass, 65mm thick. cover; modify soil with 22. Precast concrete ‘safeticurb’, class A (15kN). All units are compost if needed. reinforced, leave 1 mm gap between each unit to prevent damage from thermal expansion of the units themselves. 3-6 mm below the level of surrounding pavement surface. Cleaning or unblocking maintenance. Supplier: Aggregate industries. 31 23. 25mm thick mortar mix in class 1 (1:3) 300 24. ST4 concrete bed and haunching. Haunch to extend to half unit height. 105 115 25. Bedding sharp sand blinding, 50 mm thick. 300 26. 2 No. H12 Dowels bars 50mm long @ at 900 centers along length of channel. 27. A252 mesh at the bottom tied to base slab. 28. Concrete corduroy hazard paving 400 x 400 x 50 mm in buff color at the top tand bottom of steps. Supplier: Marshall. 6. Newton Geodrain: 6mm stud Cavity Drain membrane (high quality polypropylene). Supplier: John Newton & Co Ltd. 7. Geotex (welded to face of Geodrain) a filter fabric thermally welded to the studded face, allows water to pass into the cavity, not allow fines or sediments to pass into the cavity to drain water away to a suitable point. Any water entering the cavity immediately de-pressurises and falls down to the pipe underneath. 8. Corrugated 100mm diameter perforated pipe, supplied in 25m coils. Individual lengths of pipe can be joined together using the connector, one of which is usually attached to each 25m coil. 9. Staffordshire red brick to match with the colour of tree bark with size 215mm x 102.5 x 65mm. F2/S2 Facing bricks chosen for good quality and colour as well as weather resistant for the main body. Stretcher-bond for this cavity wall. Suppiler: Wienerberger manufactures. 47 10. Projecting copings (F2/S2), min 400mm projections: double single bull-nose manufactured special brick laid on edge, moulded stock bricks by hand or machine to create profile of brick. F2/S2 rated coping in M12 mortar (1 part cement ¼ part lime 3 parts sand) formed from a dense facing brick type with smooth texture and a water absorption ≤7%. How does vegetation influence the people’s movement in Vienna ? Threshold of this geometrical form of vegetation alongside the Litche Alee of Schonbrunn Palace informs your signal arrival to my portfolio It is your choice to explore further or to just stay outside this entry.